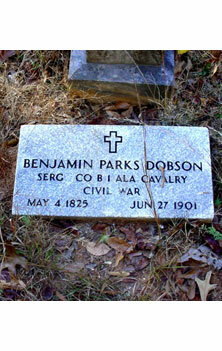 Benjamin originally served in the 53rd Alabama Mounted Infantry Regiment, Co A, CSA, enlisting June 1, 1863. His neighbor and brother-in-law, James M Bowen, had enlisted exactly six months prior and died Sept 12, 1863 of sickness at Roddey's encampment in Russellville, AL. Benjamin had owned slaves as late as 1860, as did James Bowen's family. But Benjamin's Confederate service conflicted with his Whig-Republican family's convictions, being descended from hero Captain John Dobson, who died at the pivotal Battle of Ramsour's Mill during the Revolutionary War. Perhaps due to the death of James, the harassment of Yankee marauders back home, and the chronic hardships the 53rd was suffering, Benjamin had enough to desert the 53rd at near Tunnel Hill on March 6, 1864. Ironically, there were five Confederate deserters from Roddey's Battalion who showed up at one of the Union camps that same day and with valuable information -- can't help but wonder if Benjamin was one of them.